Train with versatility when you step up to the ProForm hybrid Trainer. Choose from a cardio recumbent bike workout or a total toning Elliptical PROGRAM. With 16 workout apps fully loaded and ready to go, you just have to press start. The 16 digital resistance levels take you from beginner to advanced as you progressively get stronger. 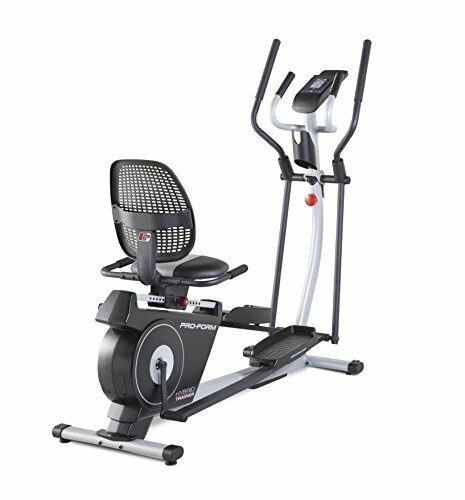 Now it's easier than ever to choose your workout-from either a cardio recumbent bike or a total toning Elliptical. Plug in your iPod or MP3 player to make every workout more energetic with your favorite tunes. The hybrid Trainer is double the functionality at an incredible price.